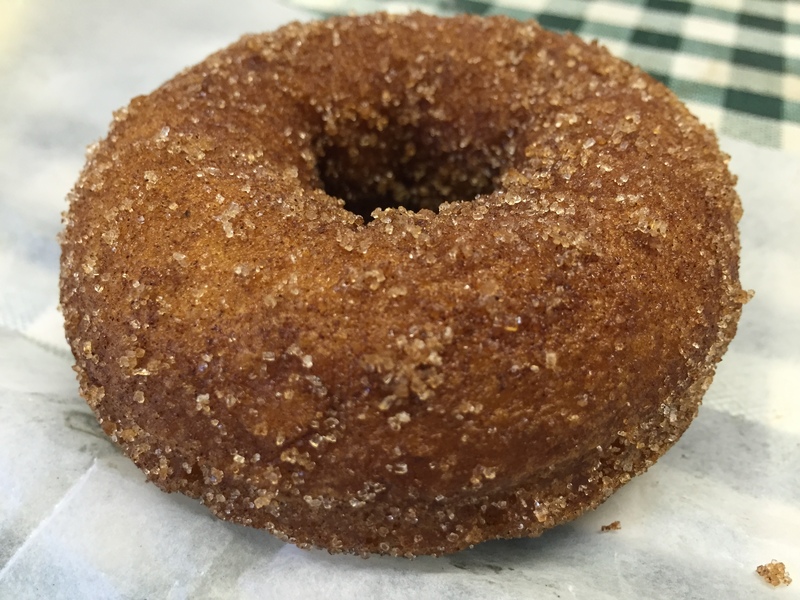 Who has the best cider donuts in the Capital Region? Indian Ladder Farm, Golden Harvest Farms, Hicks-Wilson Orchard, The Carrot Barn, and Cider Belly. How do I know? 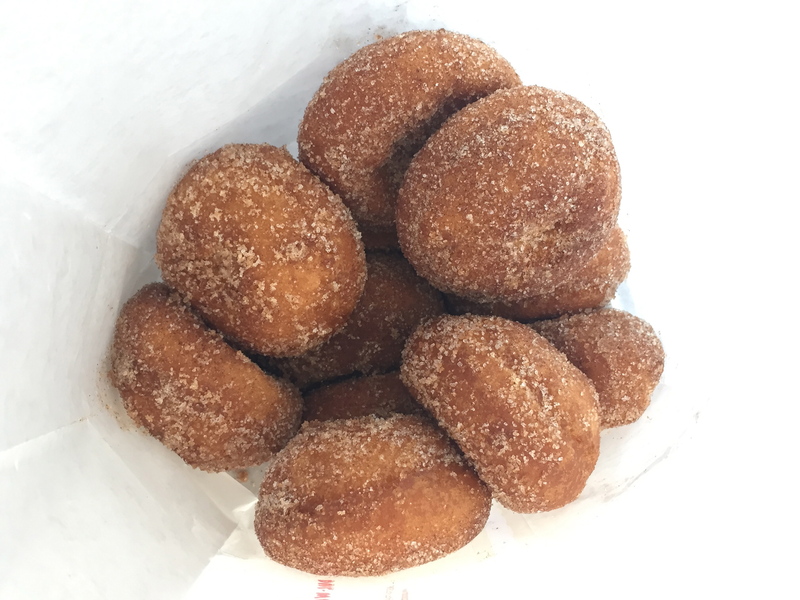 Because with the help of countless volunteers, we have pitted the cider donuts from twenty-five of the area’s most beloved orchards and bakeries against each other and these were the five that rose to the top. However, this project is far from complete. Last Saturday eleven of us ate our way through five more versions of this regional specialty. 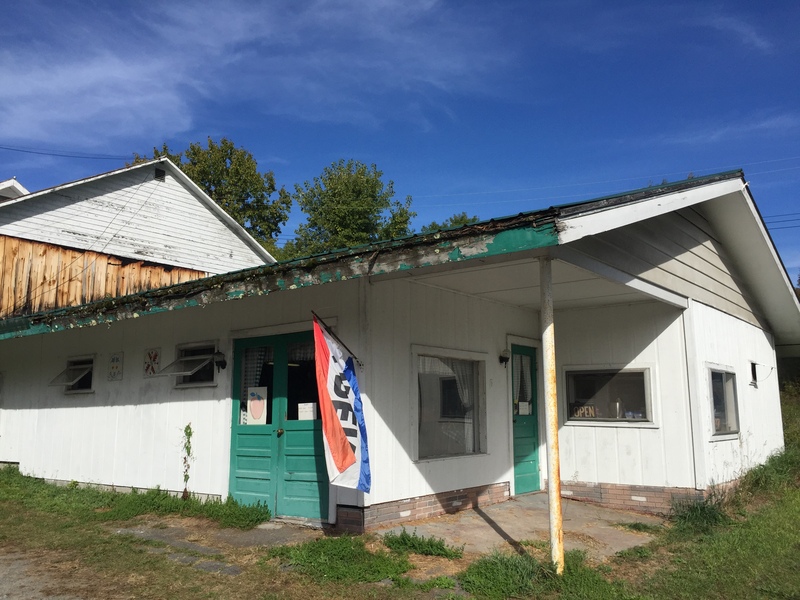 This year we focused entirely on the westernmost edge of the Capital Region, starting up north in Mayfield and ending almost due south in Schoharie. And you know what? This was by far the best Tour de Donut yet. There’s usually one place that just doesn’t quite measure up, and this tour had that. But all of the other stops were excellent. Each one was at least someone’s favorite of the day. 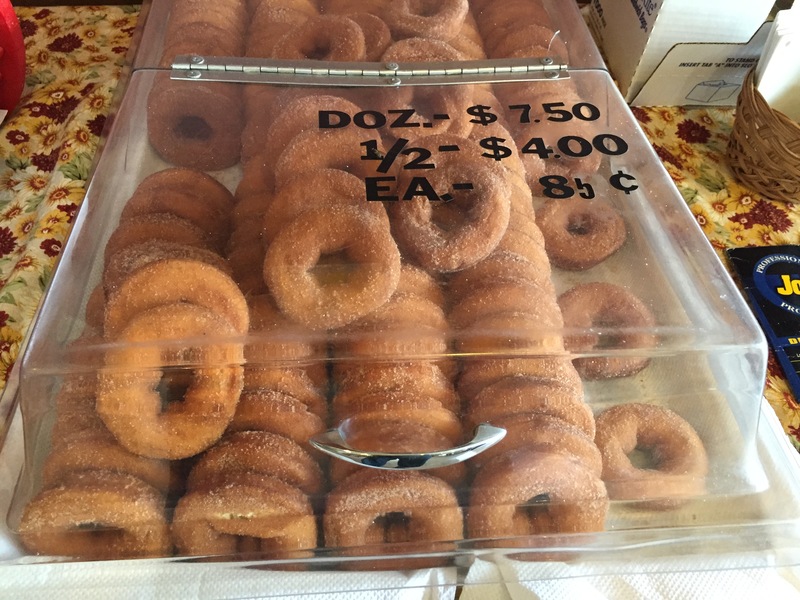 And at each of those four orchards, we were able to procure hot cider donuts! This year’s contest was closer than it might appear. But to tell you the story, I’ve got to run you through the numbers. Before I totally spill the beans, let me tell you how the day played out. After driving past Lake View Orchards in Mayfield a few times, all eleven of us eventually made it into the parking lot by 10:30am on a gorgeous Saturday morning. This place is hard to find, since beside the open flag dangling from a pole on the corner of the white shed, there is nothing to indicate the presence of a beloved local orchard. But pulling open the green door, it was clear we were in the right place. It’s a mom and pop operation filled with homemade baked goods, and pop behind the counter manning the donut robot. The smell was intoxicating. A dozen cost $7.50 and we were instructed to carry the bag from the bottom, and not to squeeze them, lest the hot donuts get crushed. There were a few tables in the back, and we were told that it was okay to sit there while eating our donuts. While we were at the orchard, a steady stream of locals came and went for their morning carbs, fats, and sugars. Chad V.’s notes read, “Great sugar coat. Texture pillowy. Was fantastic warm. Crust very good, but sugar was star.” And I agree, we were off to a solid start. There was a definite hint of nutmeg, but some participants were put off by the heavy handed cinnamon component in the sugar. Gorgeous Goodness noticed a lingering off flavor, which wasn’t noticeable while eating these tasty donuts, but was inescapable on the drive down to our second stop. Still, this was Chad V.’s favorite donut of the tour. Rogers Orchard in Johnstown was next, in what would seem to be the cursed second stop. In six years of doing this tour, the donut tried second has never won. Indian Ladder won in the first spot, Golden Harvest won as the third stop, we went to Hicks-Wilson fourth when it snagged the victory, and The Carrot Barn took the win even as the final donut of the day. Second? Totally cursed. It was a bad sign when we walked into the bakery and were greeted by the donut dome of doom. There was no smell of frying donuts. No donut robot in sight. I even asked if there was another place to get the donuts at the orchard, and if there was any chance of getting them hot. Nope. Clearly, donuts aren’t the focus of this orchard, and it shows. These were the stinkers of the day. Our $7.50 dozen was room temperature and oddly dry. Still, Gorgeous Goodness and her companion praised the donut’s overall taste. I found a thin crispy edge that went around the equator of the donut, but I longed for a crustier specimen, with a moist interior, and a more even sugar coating. Sand Flats in Fonda was a hoot. This place was huge, and there was clearly a ton of stuff to do. Still, we stayed laser-focused on the donuts. We found our way into the bakery where donuts were coming right out of the robot, and placed directly in bags, which were then sold immediately to customers. Our dozen was once again $7.50 and we were able to take these to the tables in the room adjacent to the bakery and evaluate these unusual specimens. Holy moly! If you like donuts with a crisp crust, then get out here stat. Because, damn, that’s a serious fry job. And it’s the factor that made Fuddley declare this to be his favorite donut of the day. 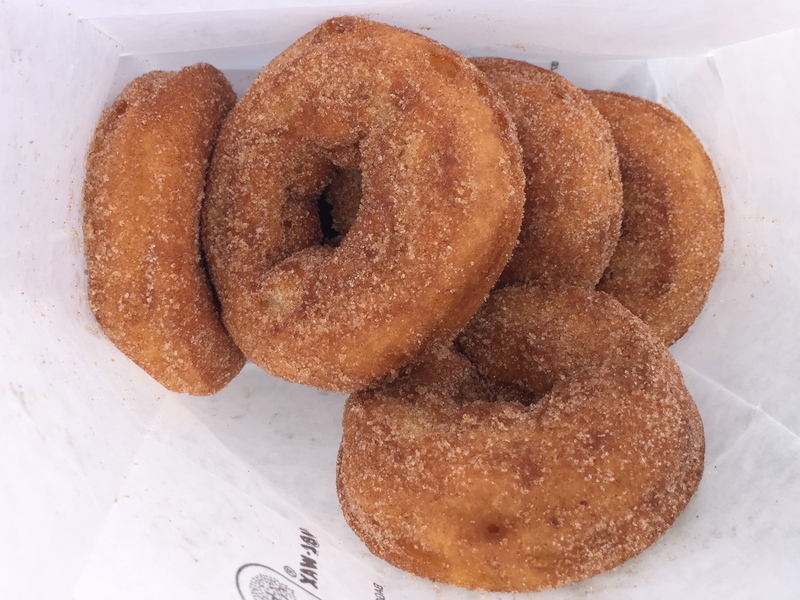 As he wrote, “The crunch just made it.” However, others noted more vanilla flavor than cider, and wanted for a better coating of cinnamon sugar to help make these a more traditional cider donut experience. Without a doubt, these were great donuts, but just not what most people are looking for in an apple cider donut. 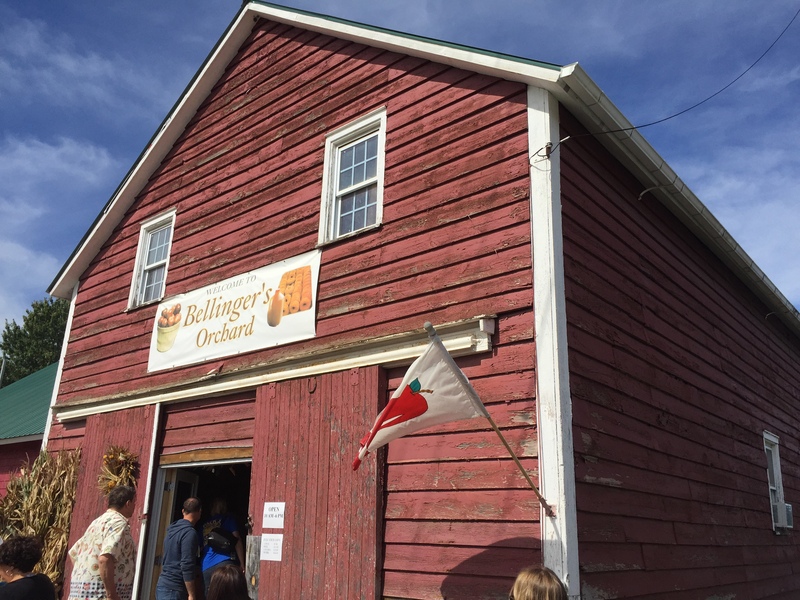 Bellinger’s Orchard in Fultonville feels like it’s out in the middle of nowhere. In fact, it seemed as if everyone visiting was simply parked on the edges of the country roads leading up to the orchard. This was the first place where the line for donuts was intense. To be fair, they typically run two robots during the weekend, but one was having issues. The upside to waiting was that just like at Sand Flats, donuts were coming right off the robot and into customers’ hands just as hot as hot can be. I’m happy to wait for excellent cider donuts. And these were excellent. Steve N. and I called this our favorite stop of the day. 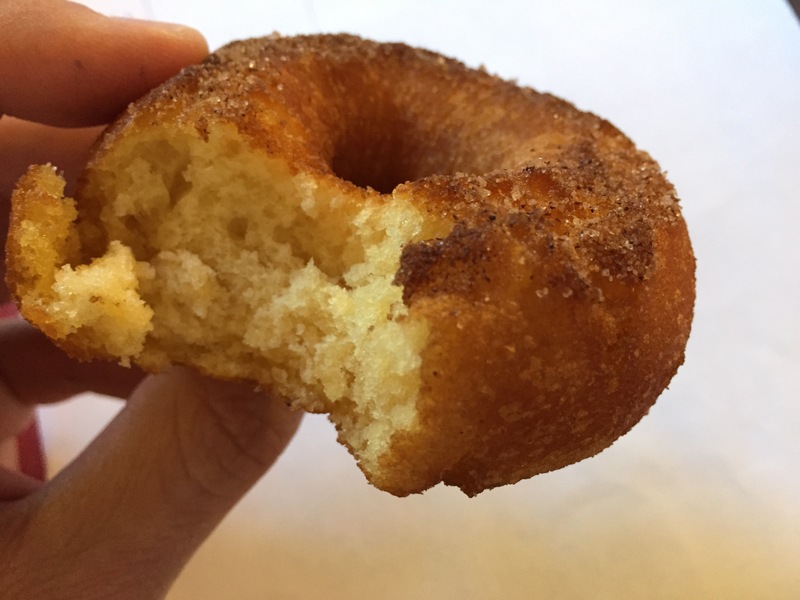 He praised its “perfect amount of sugar, moist tender texture, and good cider flavor.” For me this was just the strongest donut overall from texture, to crust, to sugar, to flavor. As Otis M. noted, one of the sides wasn’t as crispy as the other, and he was right. But I’d rather have a donut with perfect crust on 60% of its surface than a donut with middling crust evenly distributed across the whole thing. There was a lot of love for this donut among the tasters, and had we concluded the tour then and there, Bellinger’s would have won by a significant margin. But we had one last stop to go. 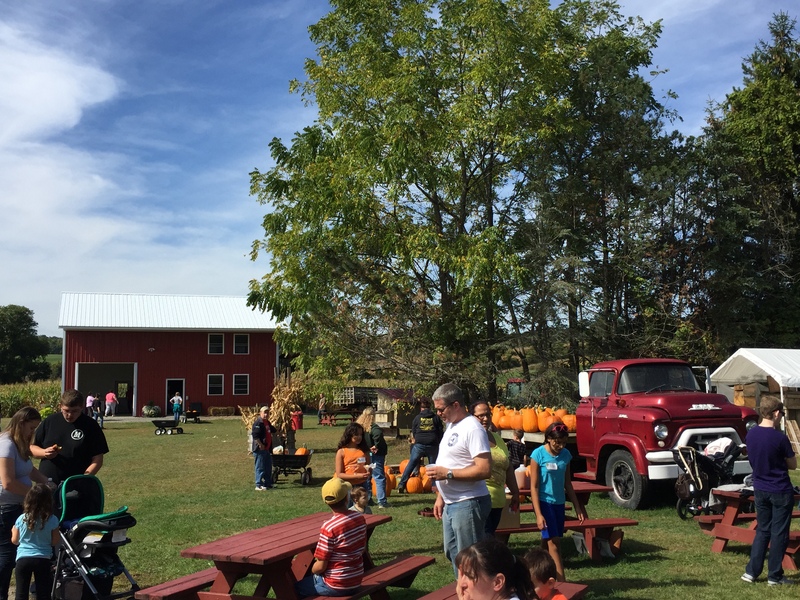 And that stop just happened to be Terrace Mountain Orchard in Schoharie. Walking into this place, there were bags of pre-packed donuts behind the counter. When I asked for our dozen, the clerk reached back to grab one of those bags. But as per the Tour de Donut protocols, I asked if I could get some that were hot. Without blinking, she ran into the back and came out with twelve steaming beauties. These apple cider donuts are smaller than all the others we had that day. Of course they are also a bit less expensive at only $6.50 a dozen. For donuts this good, that’s a shocking value. Gorgeous Goodness wrote that it was “like a cloud of donut perfection.” The interior of these donuts was so soft and moist that I found it to be almost pudding-like. That contrasted with an avalanche of cinnamon sugar that provided a significant textural contrast and crunch. The cider flavor was strong, and in the end, seven evaluators found this to be the best donut of the day. For my taste, all that sugar got in the way. Not only was it messy, but the exterior sugar pushed this donut from sweet to almost cloying. Even still, it would have been my choice for number two, because man that’s a good cider donut. So, how was this not a blowout? Well, even though Terrace Mountain was the clear favorite, by the numbers it just edged out Bellinger’s. On the all-important overall score, Terrace Mountain won by just four points. It was 89 to 93 (on a 100 point scale). The raw numbers were even closer, with just Bellinger’s earning a 49 versus Terrace Mountain’s 51. Lakeside came squarely in the middle of the pack. And despite Sand Flats’ excellent fry job, its vanilla-forward specimen failed to light up the scoreboard. But that hot crispy donut did beat out the room temperature donuts left out at Rogers’ self-serve donut counter. Can I tell you a little secret? After the tour ended, and I said goodbye to everyone, I went to The Carrot Barn for a sixth donut. Really, if you wanted to repeat this tour on your own, I’d skip Rogers and hit that second Schoharie orchard for yet another excellent donut from the western edge of our region. Although, if you do take the modified self-guided tour, start in Schoharie and work your way north. The secret to tour success is to front-load the eating and back-load the driving. Thank you once again to everyone who came out on this adventure and lent their bodies to science. Congratulations to Terrace Mountain and Bellinger’s for their great showing in this brutally hard challenge. And I’ve got nothing but respect for Lakeview and Sand Flats who are also making great hot donuts. Rogers has good stuff too. Chad V. found “the apple cider was excellent and apple cider slushie was fantastic. Not everyone focuses on donuts, and that’s okay. I may not quite understand it. But I’ve come to accept it. Now get out west and do some donut picking. Well, maybe after it stops raining. We had a really great time, well organized and a fun group! Terrace is such a secret (maybe not anymore) gem of Schoharie. Those look so, so good and I am so, so jealous. Sounds like everyone had a delicious time! I am so hungry now, and there’s not an apple orchard remotely close to where I live in Florida. Thanks for the virtual taste of fall!